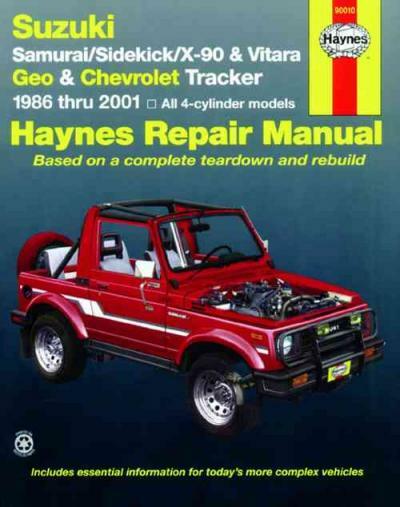 US manual covering the Samurai (known as the Sierra/Holden Drover in Australia), Sidekick (Vitara) and X-90 along with the Geo/Chevrolet Tracker from 1986 to 2001 Haynes Owners Service & Repair Manual covers all 4 cylinder petrol models. 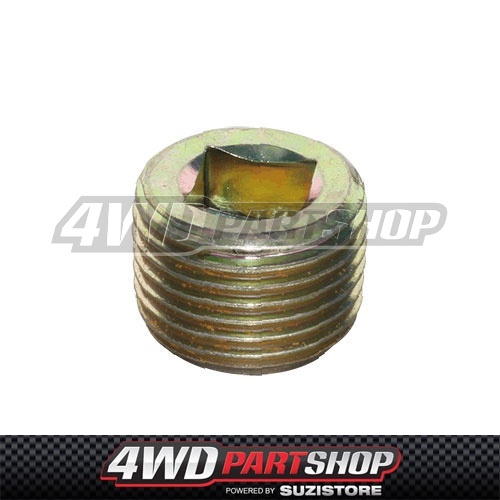 Does not cover information specific to 1.8-litre 4 cylinder or V6 models. The Suzuki Sierra a distinctive line of SUVs from Suzuki. The line were only available in 1968 as well as being still running. The history of Suzuki four-wheel-drive cars dates to 1968. Suzuki bought former Japanese automaker Hope Motor Company which in fact had introduced fifteen small off-road vehicles referred to as the HopeStar ON360. The very first Suzuki-branded 4-wheel drive, the LJ10, was introduced in 1970. The LJ10 had a 359 cc air-cooled, two-stroke, in-line two-cylinder engine. The liquid-cooled LJ20 has been available since 1972 of your most cooling changed by reason of newly enacted emission regulations, connect with one another gained 3 hp. In 1975, Suzuki complemented the LJ20 aided by the LJ50, which had a larger 539 cc, two-stroke, in-line three-cylinder engine and bigger differentials. This has been originally targeted while in the Australian market, but more exports soon followed. The Jimny8/LJ80 was an updated version with all the LJ50 with an 800 cc, four-stroke, in-line four-cylinder engine, followed by the Jimny 1000/SJ410 and Jimny 1300/SJ413. An updated version in regards to the SJ413 became the Samurai the first Suzuki officially marketed in the states. 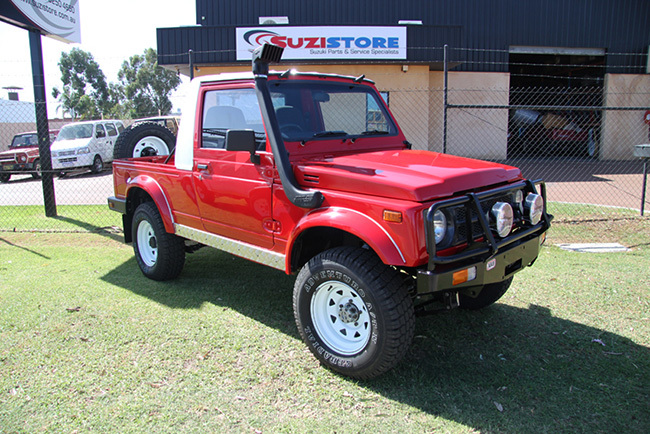 The tv series from SJ410 to SJ413 was referred to as the Sierra in Australia, and remained the Jimny a number of markets. The new Sierra was released in 1998, and now bears Tommy Hiffiger in all markets. The 1998 release used the G13BB EFI engine, replaced created by the M13AA EFI engine in 2001 in addition to M13AA VVT engine in 2005, jointly with a minor interior redesign. The SJ413/Samurai had a longer history involved in the remaining world. Australian built JA51s were sold as either Suzuki Sierra or Holden Drover, while those built in Thailand these are known as Suzuki Caribbean. Someplace Sunny And Warm is available considering that the "Caribbean Sporty", a unique LWB double cab pickup. Because of the various trade obstacles for Japanese cars, Spanish Santana Motors (in addition to some the SJ410) began local production with all the SJ413 in 1986. The Santana built SJs had softer springs to have an improved on-road ride, color coordinated interiors with cloth seats and carpeted floors, all to broaden capture the fancy of men and women who still did not intend to off-road a pick-up truck. In 1989 it received some optical and therefore chassis updates and received the "Samurai" nameplate. 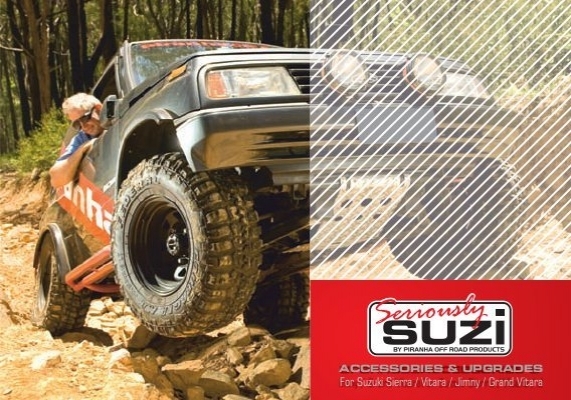 Santana built Samurais for you to utilize the updated coil sprung chassis introduced in 1998, instead receiving a facelift (new grille, more rounded bumpers) specific to European and neighboring markets. Inside of the same time, Santana also developed a version which used PSA's XUD 9 1.9-litre turbodiesel, producing 63 hp. Top speed was 130 km/h. Spanish Samurai production ended in 2003. The Samurai was sold in Colombia and Venezuela as Chevrolet Samurai, assembled in Bogotá, Colombia by General Motors Colmotores. In other South American markets (Argentina, Bolivia, Brazil, Chile, Peru, Paraguay and Uruguay) up to now sold currently being the Suzuki Samurai. Long wheelbase models were not offered active in the Mercosur. In Asia the SJ/Samurai was sold under a few different names. In Thailand this had been referred to as Suzuki Caribbean. The Thai market also received a special version referred to as "Suzuki Caribbean Sporty", a pickup with an extended cab which includes a small rear seat the right ones for occasional use. The SJ410 has also been assembled in Indonesia, where this had been marketed with some other names. The very first version is marketed as Jimny, continuing the previous LJ Jimny. The canvas soft-top model was marketed as Sierra. Along at the late 1980s, Suzuki introduced 4x2 version seeing that the Katana. Later Katanas & Jimnys received square headlights. Jimny production was stopped in 1991, while Katana remains in production until today. The Katana was also, surprisingly, used to become a basis to have an Indonesian-built, thirties' style kit-car called the Marvia Classic.. In 2005, Suzuki introduced SJ413 Caribian spacecab pickup, that led to imported from Thailand.